I thought it would be fun to share some beauty buys that I've recently run out of it. I always like seeing what other people use and love so maybe you'll find it interesting what I use too! I am not picky at all about body wash. As long as it's a clean product, I don't even care if it has a scent. I picked this up at Target when I ran out of what I was using prior, and I like it! I'll definitely be picking up more on my next Target run. I know I've raved about these many, many times but they really are the best. I use one peel (Can I just say, I think it being called a peel is confusing. Nothing actually peels off your face and you don't even wash it off!) about every 2-3 nights. The pads are very saturated so I can easily use one pad twice. I've used the pads nightly but have found what works best for my skin is to use the pads every other night. I'm actually thinking of trying the Beautycounter Overnight Resurfacing Peel for a change. Just to switch things up and see if I like it any better. I'll keep y'all posted! This is another skincare product I can't live without. I suffer from hormonal acne around those special times of the month and this soap keeps the acne at bay. I also had a bad bout of perioral dermatitis from using too many skincare products at once, I have super sensitive skin, and this and the m-61 peels knocked it out quickly. I feel like this soap is a hidden gem because it isn't a mainstream product and not a lot of people know about it but it works SO well. Already received my new bar! This was a random Target buy that ended up being a big win. I have frizzy, wavy/straight hair, it's a weird combo, and always have tons of flyways and just overall frizz all year long. This shampoo has made my hair not frizzy at all. It's amazing and I didn't know a shampoo like this could even exist, especially at the price! 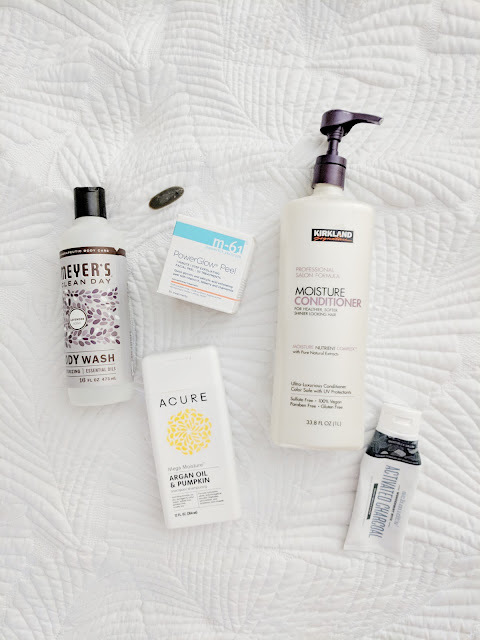 I've always loved the Acure brand because it's well-priced, clean products, so I don't know why I was surprised this shampoo would work so well. This conditioner is cheap at Costco, I think around $7.99, and works well. Don't it buy it from Amazon unless you don't have a Costco membership because it is like double the price. I like to buy a big bottle of conditioner because I have a lot of hair so I go through conditioner quick. I also use it to shave my legs. I like this conditioner because it's thick and really moisturizing. I feel like so many conditioners that claim to be moisturizing are so watery and don't conditioner your hair at all. It's a fairly "clean" product too which is a nice perk! I bought this thinking it was going to be some magic whitening toothpaste and it just wasn't. I mean it worked fine as a toothpaste and it's clean and free from fluoride, but as for making my teeth this bright white like it claimed, it did not. For some reason I ended up picking up two tubes so I have another tube to use. Prior to this I was using Weleda Salt Toothpaste and I liked it a lot but it's pretty pricey for the size and literally tastes like you're brushing your teeth with salt- well, because you are. So not sure what I'll use when I finish this next tube. Maybe I'll try the legit charcoal toothpaste that actually turns your mouth black and then makes your teeth super white. If anyone has any charcoal toothpaste you've loved, let me know! I know that people are really afraid of fluoride these days, but it's actually really good and helpful for your teeth. I use a fluoride toothpaste, occasionally drink city water, and get a fluoride treatment on my teeth every 6 months. I've had many talks with my patient's parents about this! LOL! Your shampoo sounds really interesting! I can't imagine Argan and Pumpkin! Cool! Guess I should have mentioned that I don't like to use fluoride because I *think* it may have contributed to the perioral dermatitis I had. Don't know for certain but I was trying to stop using a lot of products to see what was the culprit and I never went back to it using it because the PD went away! So who knows if it was the cause! I still get fluoride treatment at the dentist and drink city water as well so definitely still get it! Thanks for the info!